Classes will resume Tuesday, April 10th. Check below for events and announcements for when we return from break. Summer is approaching and it is good idea to start looking at different summer opportunities that can help build your college applications and offer you first hand experience in college environments and learning college level curriculum. MUST be 16 or older to donate. If student is 16 years old, a consent form is required and can be picked up from DVC Leadership. 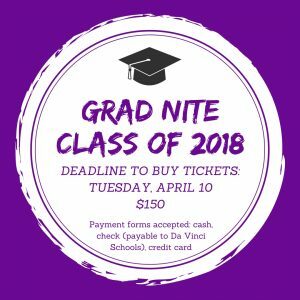 Sophomore Night: Brittany will be hosting a Sophomore Night on April 23rd at 5:30 p.m.
We will give tips on A-G requirements, graduation requirements, how to have successful junior year, understanding PSAT scores, and parent involvement. The meeting will take place on Da Vinci Communications High School floor and the room is TBD. We highly encourage all sophomore families to attend. This is a reminder that the large gray building next to ours and its parking lot are private property, and our students should not be walking/riding/skating through it on their way to or from school. Also, students should not be dropped off or picked up by parents or Uber drivers in their parking lot. Please be respectful of their private property so that we can maintain the good reputation and relationship that we have with them! Brittany will be hosting a Sophomore Night on April 23rd at 5:30 p.m.
DVC Exhibition Tomorrow Night 6-7:30, Donations Needed! Spring Exhibition is here! It will be taking place Tomorrow night, March 28th from 6:00-7:30 on Communications floor. Come check out our students’ projects that they have been working hard on all semester. Family and friends are all welcomed, come show your support! Donations to Skid Row needed! 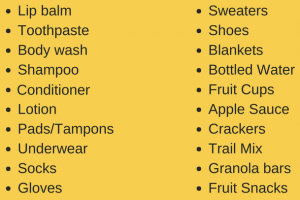 For the rest of this week, DVC is collecting the following items to provide essentials to the homeless on Skid Row. At Exhibition, you may drop them off to DVC Leadership at the base of the main stairwell. During other times, items may be dropped off to Donald’s room (Room #3403). Thank you!